You can send your wedding invitations anywhere from 4-8 weeks before the wedding; earlier if you have sent save the dates and later if you have not. The timeframe also depends on how early you want responses from your guests. We recommend setting your reply date to be 3-4 weeks before the wedding so you have plenty of time to get an accurate head count for the caterer. Are you planning a destination wedding? 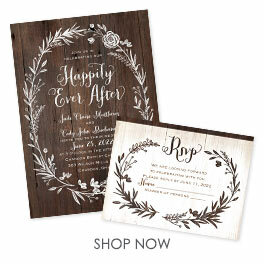 Send your destination wedding invitations 2-3 months before the date. Save the dates should be sent 9-12 months before the date so guests have plenty of time to plan and budget. Couples planning to get married on or near a holiday such as New Year’s Eve should follow the same guidelines as planning a destination wedding. Etiquette Tip: Yes, it’s okay to call, text or email wedding guest who have not responded by the reply date. If you have time, ask them to send you the physical RSVP card so you can keep it for your records.